We know #MiamiTech is proudly immigrant-powered. Now businesses can show support through campaign. How many Miami startups founded by immigrants or first generation Americans can you name? Now think about how many immigrants fuel the Miami tech professional ranks. Too many to count, right? The Miami metropolitan area (Miami-Dade, Broward and Palm Beach) ranks first among large U.S. metros for its concentration of foreign-born residents, who make up more than 40 percent of its population, nearly three times the national average, according to a report by the Miami Urban Future Initiative, a data-driven research initiative by Florida International University and Creative Class Group. The Miami metro area ranks second among large U.S. metros for its foreign-born share of residents with a bachelor’s degree or above (41.4 percent) or advanced degree (39.4 percent), according to the same report. About 54 percent of Miami area businesses are founded by immigrants, and about one in four in Florida, according to FWD.us, a bipartisan national immigration advocacy organization started by Silicon Valley tech titans. Immigrants living in Miami are 58 percent more likely to be entrepreneurs than the native-born population, according to New American Economy, a bipartisan immigration advocacy nonprofit founded by Michael Bloomberg and Rupert Murdoch. Nationally, 40.2 percent of Fortune 500 firms had at least one founder who either immigrated to the United States or was the child of immigrants. Those firms generated more than $4.8 trillion in revenue in 2014 and employed 18.9 million people globally, according to New American Economy’s report. Immigration, of course, is a politically charged issue, but what Natalia Martinez-Kalinina thought was lost in the debate was immigrants’ significant contributions to the economy. That’s why she started a campaign to bring awareness of the economic impact of immigrant-powered businesses and to connect immigrant-powered businesses with opportunities for advocacy around immigration policy. 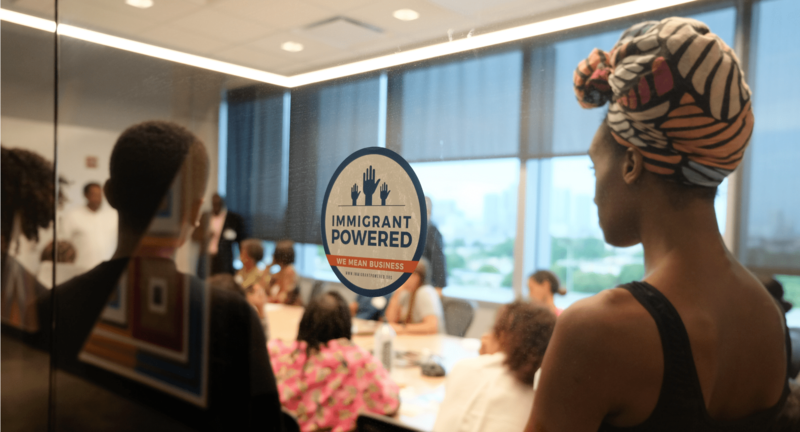 Martinez Kalinina, who runs CIC Miami and founded Awesome Foundation’s Miami chapter, recently unveiled her latest project, Immigrant Powered, in collaboration with FWD.us, IMPAC Fund and the Florida Immigrant Coalition. “Across cities small and large, immigrants are starting businesses, growing companies, funding projects that turn dreams into products, providing services, creating jobs, commercializing ideas, and investing back into the very communities they are based in. If that’s not rooted in the boldest and deepest fiber of our country’s values, I don’t know what is,” Martinez-Kalinina wrote in a note introducing the project. 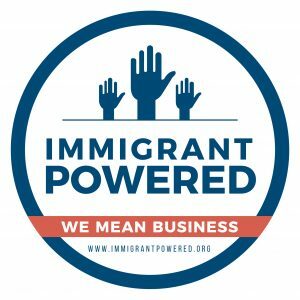 Immigrant Powered is a nonpartisan campaign inspired by campaigns such as Shop Small and Support Local. Similar to them, it initially revolves around an Immigrant Powered window decal, and plans are for a website logo as well. Immigrant Powered soft-launched in South Florida a couple of weeks ago, with the aim of expanding across Florida and possibly nationwide. So far, without much marketing, 55 businesses – including tech startups, co-working spaces, coffee shops, retail stores, a bank and service providers – have joined the movement, and Martinez-Kalinina says she plans a marketing campaign after the holidays. A question she’s been asked: Why immigrant-powered and not immigrant-owned? Martinez-Kalinina, who emigrated from her native Cuba to Mexico and then from Mexico to the U.S., said she wanted to include all businesses that consider themselves powered by immigrants in the way they define that, whether that means their business was founded by immigrants, their employee base is largely immigrants, or the customers they serve are. “Its intent is to place front and center the kind of impact that immigrants have on our economy and communities, and to add this nuance to fuel our discussions, debates and dinner tables,” she wrote. Businesses can join the campaign and receive a sticker by answering a few easy questions on the Immigrant Powered website here. Have news to report or feedback? Email Nancy Dahlberg at ndahlbergbiz@gmail.com and follow her on Twitter @ndahlberg.